KUBOTA was established in Japan in 1890. Combustion engines are manufacutred since 1922. From the beginning on the company is specialized in foundry technology. All crankcases and cylinder heads for the engines are manufactured in their own foundry. Except engines KUBOTA is manufacturing construction machines, small excavators and diggers, tractors and incinerators. MITTRONIK offers power generators with slow turning KUBOTA diesel engines with low weight in a range from 8 up to 40 kVA rated power. 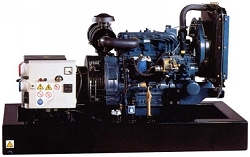 Depending on the intended use, the generators can be ordered with manual control panel (analog, key start) or with digital control panel including automatic start/stop at mains failure (AMF). The weather and soundproofed MPS generators (S for silent) are super silenced. Because of their low sound level the generators are ideal for use in noise sensitive environments, such as at events. The super-silenced generators ("S" version) have a low noise level <65 dBA in 7 meters (90 LWA). The types MPS33TDE +40TDE have central crane lifting point and side forklift pockets in base frame.